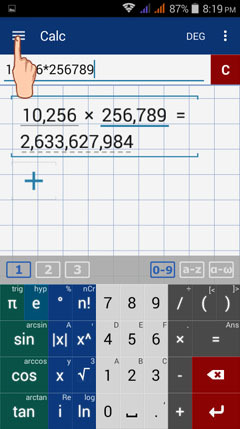 1) Tap the three lines in the top left-hand corner of your screen to open the Menu and tap Functions. 2) Tap FUNCTIONS to go to the function editor. 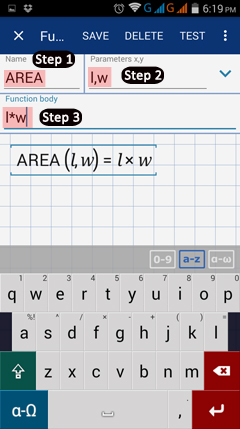 3) Tap + (plus sign) in the bottom right-hand corner to enter a function. Step 1: Under "Name," write the name of your function. 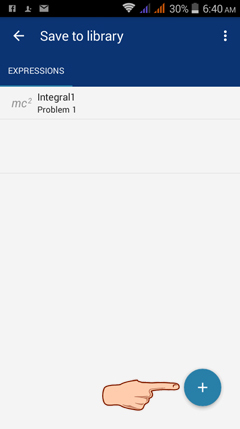 Step 2: Enter the function's parameters (up to 2 variables). Separate them with a comma. 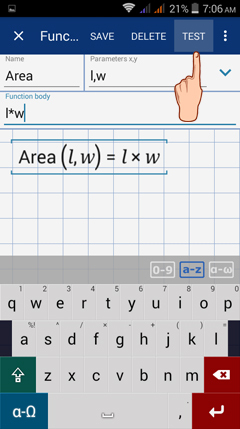 Step 3: Write the function's expression under "Function body." 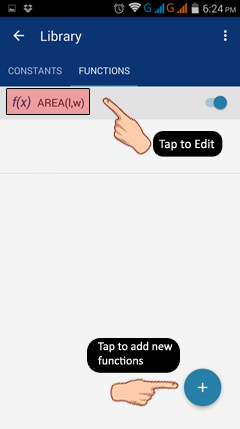 Example: Add a function (formula) for the area of a rectangle. 5) Tap SAVE to save your new function to the library. 6) Tap TEST to test the function results without leaving the function editor. To test the function, enter values for each parameter to verify that the function produces its expected results. If the function has 3 or more parameters, only 2 will be visible at a time. You can scroll through the parameters to view its other values. 7) Tap EDIT to return to the function editor. 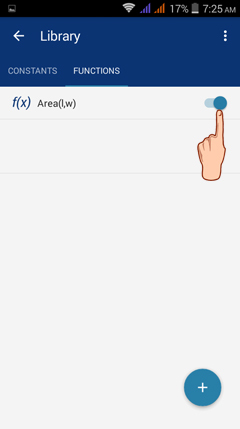 Alternatively, you can tap X in the upper left-hand corner to return to the functions list. 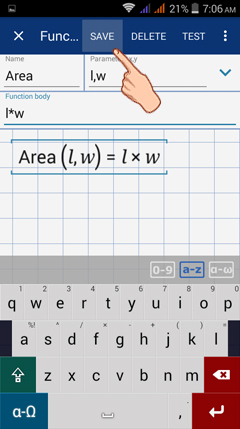 Tap the function to edit it. To enter a new function, tap the + button at the bottom of the screen and repeat steps 1-6 listed above. 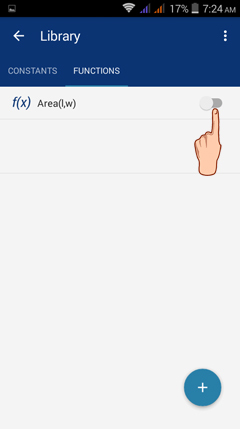 The new function will appear in the list with its parameters. 1) Tap the back button of your phone to switch back to Calc mode. 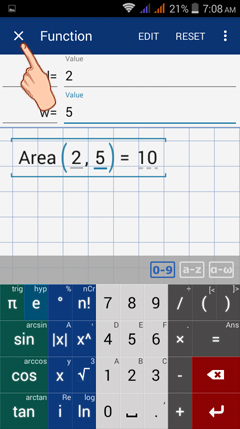 To use the formula, type the function name and enclose values for its parameters in parentheses. Find the area of a rectangle with length (l) = 2 and width (w) = 10. 1. 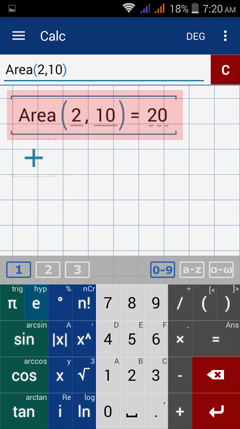 In the input window, type: Area(2,10). 2. 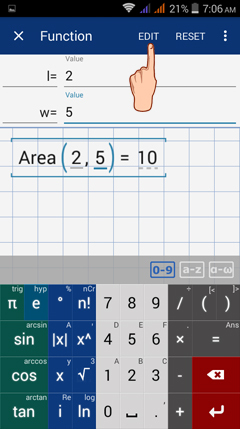 The calculator automatically multiplies 2 and 10 because you defined AREA as l × w. Thus, the result is 20. The calculator is case-sensitive. If you added the function using capital letters, you must use capital letters when you enter the function in the input window. If it was added in lowercase, the function must be entered in lowercase letters. 2) Refer to the given example in Step 1. 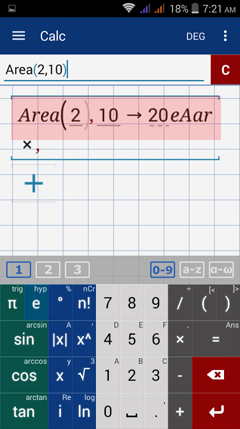 If the calculator didn't display Area(2,10)=20, then the function is most likely not activated. 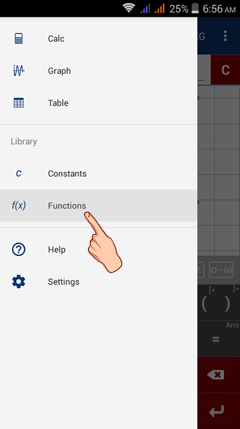 To activate the function, go to Menu > Library > Functions. The on-off switch to the right of the function must be turned on to use the function in your calculations. Tap the on-off button to activate the function. Note that the button will appear blue when the function is active. Go back to the calculator window. It now displays the expected result.